I stated at the beginning of this book that gestures come in clusters, like words in a sentence, and that they must be interpreted in the context in which they are observed. 'Steepling', as Birdwhistell called it, can be an exception to these rules, as it is often used in isolation of other gestures. In fact, people who are confident, superior types or who use minimal or restricted body gestures often use this gesture, and, by doing so, they signal their confident attitude. 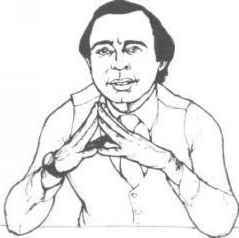 My observation and research into this fascinating gesture show that it is frequently used in superior/subordinate interaction and that it can be an isolated gesture which indicates a confident or 'know-it-all' attitude. Managers often use this gesture position when giving instructions or advice to subordinates and it is particularly common among accountants, lawyers, managers and the like. 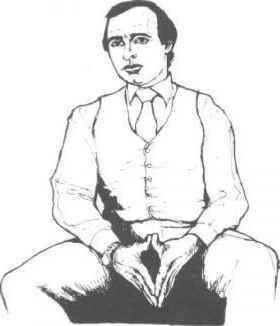 The gesture has two versions; the raised steeple (Figure 42), the position normally taken when the steepler is giving his opinions or ideas and is doing the talking. The lowered steeple gesture (Figure 43) is normally used when the steepler is listening rather than speaking. Nierenberg and Calero noted that women tend to use the lowered steeple position more often than the raised steeple position. When the raised steeple position is taken with the head tilted back, the person assumes an air of smugness or arrogance. Although the steeple gesture is a positive signal, it can be used in either positive or negative circumstances and may be misinterpreted. For example, a salesman presenting his product to a potential buyer may have observed several positive gestures given by the buyer during the interview. These could include open palms, leaning forward, head up and so on. Let's say that towards the end of the sales presentation the customer takes one of the steeple positions. If the steeple follows a series of other positive gestures, appearing when the salesman shows the buyer the solution to his problem, the salesman has been given a cue to close the sale, ask for the order and expect to get it. On the other hand, if the steeple gesture follows a series of negative gestures such as arm folding, leg crossing, looking away and numerous hand-to-face gestures, and if the buyer takes the steeple position towards the close of the sales presentation, the buyer may be confident that he will not buy or that he can get rid of the salesman. In both these cases the steeple gesture means confidence, but one has positive results and the other negative consequences for the salesman. The movements preceding the steeple gesture are the key to the outcome.